Arts Theatre, Wed 13 Jul. 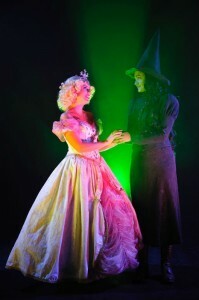 Instantly apparent is the talent that has come out of the woodwork to be a part of Matt Byrne Media’s production of Wicked – The Untold Story Of The Witches Of Oz. Throughout the show the supporting cast is in fine voice and exquisite costumes of browns, burgundy and emerald greens as they perform the roles of Shiz University students, Wiz-O-Maniacs and Citizens of Oz. Not only do Kat Jade’s stunningly soaring vocals as Galinda/Glinda immediately grab you, but the personality that she has put into the ditzy and self-obsessed Miss Popularity is perfectly perky, fervently funny and simply outstanding. Likewise is Dianne k. Lang as the verdigris-skinned Elphaba, whose vibrant vocals and unassuming presence perfectly encapsulate the shy but strong-willed social outcast. Separately they are fabulous but together, in acting and in harmony, they are symbiotically brilliant. One would hope they are being highly paid as the seasoned and talented stars that they truly are. Based on the Gregory Maguire’s novel of the same name, and beautifully married with the music and lyrics of Stephen Schwartz, Wicked is a journey into friendship, love, deception and forgiveness. 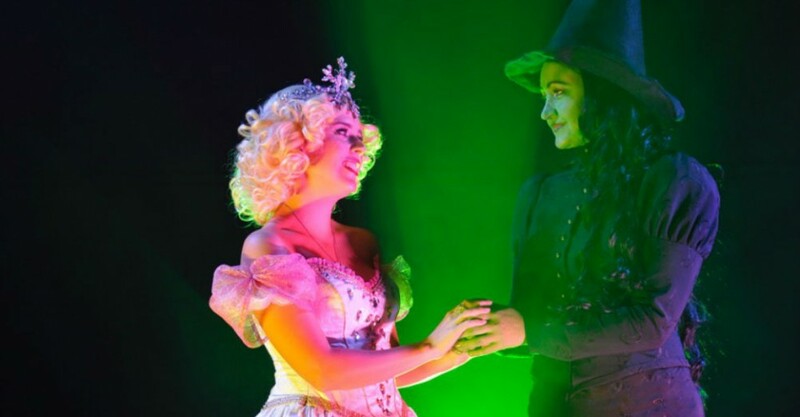 Elphaba and Glinda form an almost unbreakable bond that is tested to the limits as their lives are pulled in different directions by what they each believe to be the right thing to do, and by their love for the same man – Fiyero the Winkie Prince. Michael Bates is somewhat understated as the love interest of the two witches. The nature of Fiyero is one of self-absorption and callous self-confidence; Bates’ portrayal is sweet and maybe just a little too nice, lacking the ego and couldn’t-care-less defiance that epitomises the rich prince. His saving grace is his great voice and endearing nature. It would be fantastic if wardrobe could give more care to his costumes; making them more complimentary to his individual stature than the ones he is currently clad in. I suspect this could also help to increase his confidence in the role; he has it in him, but he is yet to completely conjure his inner Fiyero. Other stand-outs include Neville Phillis as the goat Dr. Dillamond, Sophie Bubner as Elphaba’s crippled sister Nessarose, Zak Vasiliou as the love-sick Munchkin Boq, Thomas Phillips as the winged monkey Chistery, Lisa Simonetti as the villainous Madam Morrible and Rick Williams as The Wizard. Director Matt Byrne makes his usual Hitchcockian appearance, this time as the animal catcher. Schwartz’s songs are brilliantly memorable from the ‘hating each other’ What Is This Feeling? duet between Galinda and Elphaba, to Galinda’s perky Popular and Elphaba’s soaring Defying Gravity. Love blossoms with As Long As You Are Mine while pain and anger burns within No Good Deed. One cannot help but share in the heartfelt sorrow of goodbye in the touching For Good. In fact, every song stands on its own merit, which is not always the way with musical theatre. Costumes, choreography, direction, orchestration, lighting and sets are all fantastic. The supporting cast is excellent and our two lead actors are brilliant with remarkably powerful performances that evoke emotions from within. A great job by all. You will never be able to watch The Wizard Of Oz in the same way ever again! 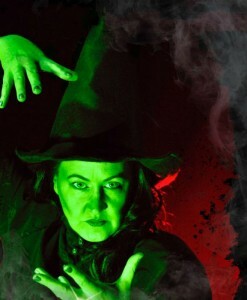 Wicked performs at Arts Theatre, Grote St, at various times, until Sat 16 Jul and at Elizabeth’s Shedley Theatre, at various times, from Wed 20 Jul until Sat 30 Jul.